Click here to read the story. Thanks PK for the link. wat religious persecutions in 2000? Nonesuch, I thought the exact same thing. Are we sure he's not Ghanaian? Nonesuch, u took the letters ooff my keyboard? I am happy for him, but we need those who are able to direct their efforts and creativity to the growth of their own country and not the furthered development of a foreign land. ireland has alot that we don't. nonesuch said it all, exactly what religious persecution happened in 2000? or maybe twas his pastor persecuting him. Suppose he is a northerner sef, i could have said 'maybe', but anyways, just in case Mr. Adebari claimed Kano as his state of origin....anything can happen, abi. On another note, you mean our guy never heard of Lagos-state, the land of the free? "A Christian from Nigeria, he was forced to flee his hometown of Okeodan in the south-western state of Ogun because of religious persecution." Hmmm - what kind of religious persecution is there for a Christian in the South-West? 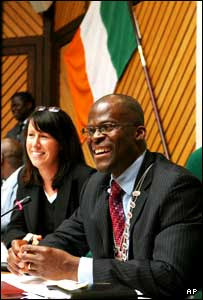 As other commentors have quickly noted, it does look like a bit of convenient form filling..
Why is all these force about this successful naija ireland mayor.Anything could have brought him there,persecution or not,the guy is only fulfilling his destiny.No be all cloth them dey put for sun ho!dem go fit don pursue the guy with KURUBE, wey he come go jam his destiny that side........!! !